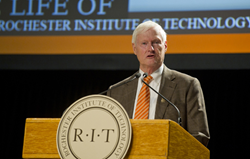 William W. Destler, Rochester Institute of Technology’s ninth president, announced today (May 9, 2016) that he will retire at the end of the 2016-2017 academic year. William W. Destler, Rochester Institute of Technology’s ninth president, announced today (May 9, 2016) that he will retire at the end of the 2016-2017 academic year. Destler’s career in higher education has spanned more than 40 years, with his last decade serving as RIT’s leader. A nationwide search for a successor will begin immediately. Under Destler’s leadership, RIT’s enrollment has reached record levels, selectivity and diversity have improved, the value of research awards has skyrocketed and geographic draw continues to widen across the U.S. and overseas. Destler accomplished his vision of turning RIT into one of the most innovative universities in the world. The Imagine RIT: Innovation and Creativity Festival has attracted more than 250,000 visitors to campus since it launched in 2008, and RIT can boast about award-winning programs in a host of uncommon disciplines, including packaging science, computational astrophysics, sustainability and interactive games and media. During his tenure, the Carnegie Classification of Institutions of Higher Education reclassified RIT as a doctoral university, reflecting the rapid increase in the number of Ph.D. degrees the university grants each year; RIT’s ninth college, the College of Health Sciences and Technology, launched; the Vignelli Center for Design Studies opened; the Golisano Institute for Sustainability created the world’s first Ph.D. program focused on sustainable production; and RIT was among the first universities in the country to create a department dedicated to computing security. Destler also helped make RIT a greener campus. Since 2008, RIT has opened three LEED certified buildings, including the first building in Monroe County to be certified LEED Platinum by the U.S. Green Building Council and a state-of-the-art green facility for the Golisano Institute for Sustainability. Last year, RIT took another step toward carbon neutrality by opening a massive solar energy farm. Destler, who became president of RIT on July 1, 2007, and his spouse, Rebecca Johnson, expanded RIT’s relationship with the community. Destler and Johnson created the Rochester City Scholars program, which gives Rochester City School District graduates who meet certain requirements free full tuition to attend RIT. RIT also partnered with Uncommon Schools to develop a charter high school in Rochester. Christine Whitman, chairman of the RIT Board of Trustees, said Destler has positioned RIT well for the future and that growth will continue as the 2015-2025 strategic plan is deployed. Destler came to RIT from the University of Maryland at College Park, where he spent more than 30 years, rising from the ranks of research associate and assistant professor of electrical engineering to senior vice president for academic affairs and provost. He is an international authority on high-power microwave sources and advanced accelerator concepts and one of the world’s foremost collectors of antique banjos.